Preorders are expected to ship in late December 2012. Please note that the plushes will probably arrive after the Christmas holiday but we'll update accordingly if this expectation changes. «©NCSX» Sanei hit it big with the Pikmin and Mario plushes and they're sticking with Nintendo for their next big thing. 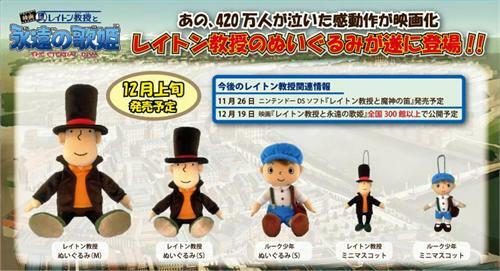 Five Professor Layton plushes arrived yesterday including a small-size Luke keychain plush which measures 4cm (1.57") at JPY700 (US$10.90) and a medium-size Professor Layton plush which measures 35cm (13.77") tall at JPY2200 (US$25.90). Please note the sizes of the plushes are larger than what Sanei originally listed on their solicitation a couple of months ago but the correct measurements of each plush are listed below. Preorders have shipped as of yesterday and new orders are welcome. If we sell out in the next few days, please note the next batch is not expected until after Christmas. Sorry. Due to time constraints, we'll post a proper photo gallery within a few hours (well, maybe by tomorrow morning if things get hectic). 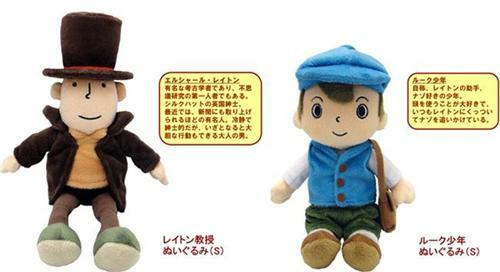 Three years before the events in Professor Layton and the Curious Village, the good professor and his young disciple Luke find themselves in another curious village with a strange legend. Professor Layton and his young charge Luke are back in another adventure where their wits are tested by a series of intelligent and well designed puzzles. Professor Hershel Layton is an experienced problem/puzzle solver and his young assistant Luke Triton isn't too shabby himself.